This past weekend was a cookie weekend. I knew that much going into it. It's the Christmas season and to me (to everyone?) cookies and Christmas belong together. Maybe it's the Santa Claus thing or that they're so easy to share; maybe it's that they both begin with "c;" and just maybe it's that scene in A Muppet Family Christmas when Animal sees Cookie Monster for the first time; but whatever the reason, when I think Christmas, I think cookies. And when it comes to Christmas cookies, I absolutely love shortbread. 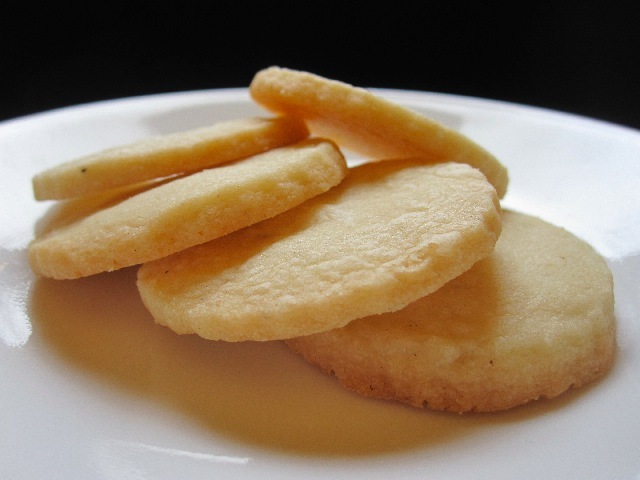 Nothing beats a simple, traditional, well baked shortbread. Flavour, texture, it's impossible to resist. However, on this weekend shortbread wasn't even on my radar. It took my brother's suggestion that I bake it for Christmas Day before I realized that a) I had never made shortbread b) I should make shortbread c) forget Christmas I'm making shortbread :). I wanted classic shortbread. Sugar, butter, flour and a little flavouring. No more, no less. Now, you might notice that my recipe (and plenty of others) does not follow the classic 1:2:3 ratio for the sugar, butter, and flour. This is a result of the inconsistencies of measuring flour by volume. As a test, I started with the correct ratio of flour, 3/4 cup, but based on my 130 grams per cup standard. After adding the flour to the dough its consistency more closely resembled frosting than cookie dough. Instead of taking the time to play around further, I just went ahead and added the full cup (130g). Next time I think I'm going to add the flour bit-by-bit to see exactly how much flour is required to bring the dough together. At the very least it's an interesting experiment; at the most, it might produce a better shortbread. There's really not much to mess around with when making shortbread. Other than halving the recipe, I felt it the perfect opportunity to try out my Mexican vanilla powder. This is something I have wanted to do for quite some time. And because it seemed like a bad idea to add anymore liquid to the dough, the vanilla powder was the perfect solution. I also loved the idea of a salty-sweet shortbread and decided to take a risk and double the amount of salt in the recipe. My method for rolling out the dough was to not pay attention to what the recipe said. Classic Adam. I rolled out the sticky dough to nearly its final thickness without using flour. I then chilled it in the fridge, removed the dough, and finished rolling it out. The dough is so easy to work with when cold, and again, I did it all without flouring my counter top (I like making things extra difficult). To ensure the cookies didn't spread too much, I also chilled the cut out cookies for a few minutes before baking. In defence of my ineptitude (if there is one), I don't make many cut out cookies. I didn't even own cookie cutters before this recipe. In case you're wondering, yes, this made me feel nothing but shame :). Thankfully, when everything was all said and done the shortbread tasted exactly like shortbread should. Not too sweet, subtle vanilla flavour, the only difference was a nice hint of salt with each bite. 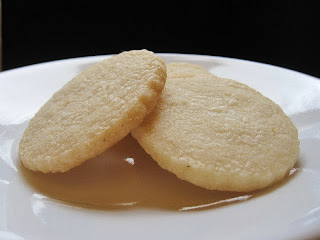 The texture was wonderfully delicate in that melty, crispy, crumbly, shortbread way. My family devoured them in no time. Though as good as they were, for me, something seemed to be missing. I think it was definitely caused by the thickness of the cookies. I wanted more texture, more crumble with each bite. Next time I'm going to make them twice as thick. It's a minor gripe and nothing to do with the recipe; the flavours and texture were spot-on. In a small bowl add flour, vanilla powder and salt and whisk to combine (if using vanilla extract do not add it here). In the bowl of a mixer cream together butter and sugar until creamy and smooth. If using vanilla extract, beat in vanilla until combined. Reduce mixer speed to low and add flour mixture, mixing until just combined. If necessary, lightly flour counter top. Roll dough out to a 1/4 inch thick and using your favourite cookie cutters, cut out as many cookies as possible. Gather scrap dough, reform into a disk and cut out more cookies (if dough becomes to warm and sticky, chill again). Optional: Before baking chill cut out cookie dough for five minutes on cookie sheet. If cut out cookie dough is room temperature, bake for 8 to 10 minutes or until edges are golden brown. If cut out cookie dough is chilled, bake for 10 to 12 minutes or until edges are golden brown. Allow to cool on cookie sheet for two minutes before moving to rack to cool completely. I too associate Christmas with shortbread--I think it's the 'classic' nature of the cookie, and its hint of Britishness. It's nice to know I'm not the only low-tech food blogger out there--most of them seem to have nine million cookie cutters! And I agree on the thickness--for some greedy reason, thick shortbread is so much more satisfying. Like eating thickly-spread, rather than thinly-spread butter. @Mary - I'm not even buying fancy cookie cutters. I bought about 3 sets from the dollar store (which is really misrepresenting it's name these days :). And not that there's anything wrong with butter, but how 'bout thickly spread peanut butter?... mmmmm..
@Allison - See these are the fancy things I don't know about. That sounds WAY awesome... WAY! I gotta get me one of those. Maybe tomorrow because I'm baking all day Friday. Thanks! And see you Saturday.. Really excited :)! I agree with Allison. Patterned pans are the way to go with shortbread. These sounds perfect for Christmas!